The USDA estimates that a family of four spends between $128 and $147 on groceries each week. More liberal spenders will spend as much as $300 a week on groceries. Those numbers are astounding, especially when you have kids. Emergencies can come up and then you are in a crunch. It’s crucial to have a go-to emergency frugal menu. Establishing an emergency menu is a good idea because sometimes you need to adjust your budget when an emergency or unexpected cost arises. For instance, if your child needs money for a field trip, you’ll feel good knowing you have a backup menu that can save you $70 to $100 that will go toward their needs. The same can be said of an emergency. If you get a flat tire, you’ll have no worries about feeding your family because you can trim your grocery budget significantly by hitting up your emergency menu. To have a successful backup grocery list you need to determine what foods your family will and will not eat. If you have any picky eaters in your house, you’ll want to ensure any foods they won’t eat aren’t included in your plan. Then you’ll need to set a budget for your emergency menu. The most frugal menus for a family of four normally land between $50 and $100. Once you have a frugal menu planned out, add up the different items you’ll need to pull the meals together. If you shop sales or use coupons, be sure to include those when tallying up the cost. Once you’ve done the math, if your menu doesn’t land within the budget you set, you’ll need to rework it. To do this, consider removing the most expensive meals on your list and replacing them with something cheaper. 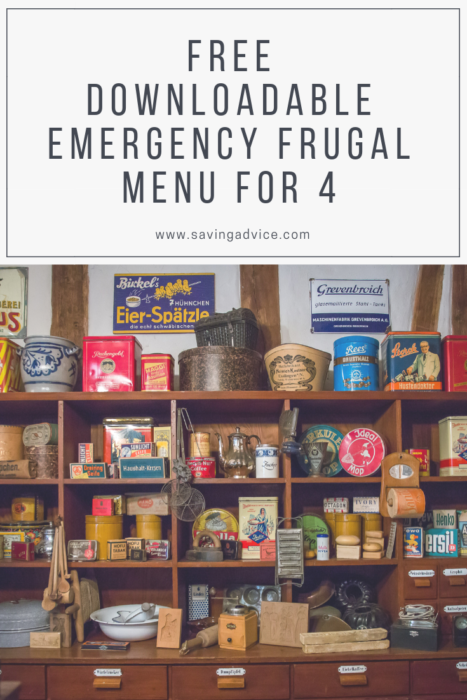 The emergency frugal menu below will feed a family of four for around $65. Prices listed below are from Aldi in Charlotte, NC. You may need to make some adjustments for your family’s needs and location. Below is the “shopping list” for a complete menu. The total cost for this specific meal plan is between $55 and $65. Download a copy of the entire menu here. You can narrow your breakfast budget down to about $10 for the week if you purchase the following items. You can always serve up leftovers for lunch. However, if you have kids in school you may need to pack lunch for them. If that’s the case, you can keep things to about $10 for the week by buying the items below. Depending on your family’s preference, fruit is always a great, low-cost snack. You’ll already have apples and bananas for your kid’s lunches but you may want to grab an extra bag for snacks. Another great, low-cost snack is yogurt! You can pick these items up for the prices listed below. Overall, snacks will only take about $5 of your emergency menu budget. Dinner will require some planning, of course. One of the things most people don’t realize is that they can plan multiple meals around the same meat purchase. 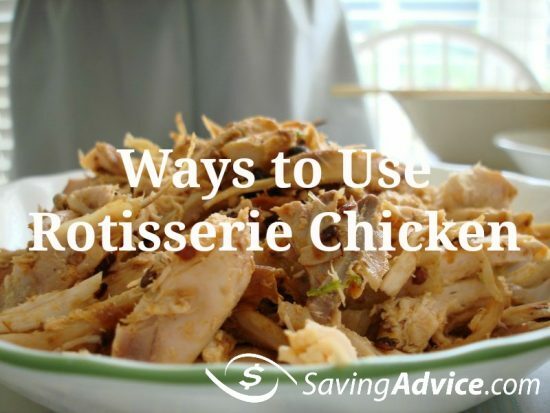 For instance, when you roast a chicken, you can use the leftovers to make chicken and dumplings. Here are just a few frugal dinner menu items and how much each cost. With this plan, you can feed your family dinner for an entire week for around $39. Below are the individual items you’ll need to pick up to pull it off. This is just one of many combinations you can come up with when crafting your emergency frugal menu. Depending on your family’s preferences and your willingness to trim your regular eating habits, you can probably get out of the grocery store even cheaper! To download a FREE copy of this meal plan, click here. Readers, do you have a go-to emergency frugal menu? What does it include?